You’ve always wanted to own one of their cars, but would you want to own a piece of the company? That could very well be the possibility as Mazda’s Philippine distributor plans to list some of its shares on the Philippine Stock Exchange (PSE) by the first half of 2017 at the latest. 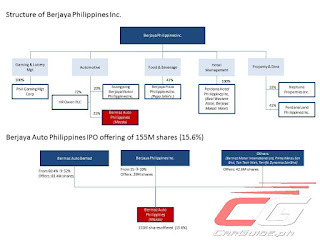 Bermaz Auto Philippines (BAP), formerly known as Berjaya Auto Philippines, plans an Initial Public Offering (IPO) worth P 1.24 billion or about 15.6 percent of the company. In a disclosure made by parent company Berjaya Philippines, BAP has filed its registration statement with the Security and Exchange Commission (SEC) seeking permission to list on the PSE next year. If approved, BAP will offer 155 million shares (15.6 percent) at a maximum price of P 8 per share to the public via the IPO. Currently, BAP is majority owned by Bermaz Auto Berhad (60 percent) and Berjaya Philippines (25 percent). The remaining 15 percent is spread across other companies. With the IPO, both Bermaz Auto Berhad and Berjaya Philippines will reduce their shareholdings in BAP to 52 percent and 20 percent respectively. The funds raised from the IPO will be used to construct a new warehouse that includes a body and paint facility (P 400 million), new showrooms and satellite offices (P 188.5 million), and a Mazda training facility for automotive repair and motor services (P 50 million). The remaining funds will be used for working capital requirements including payment to suppliers. Investment in a new warehouse signifies BAP’s bullish outlook for Mazda vehicle sales for the local market. In fiscal year 2016, Mazda sales have jumped 32 percent compared to 2015 (4,684 versus 3,561). In addition, the body and paint facility will help defray costs since that is the company’s largest expense comprising 7 to 9 percent of total operating costs. The automotive segment of Berjaya’s business (HR Owen PLC, Bermaz Auto Philippines, and SsangYong Berjaya Motor Philippines) contributes to a majority of the group’s revenue averaging 91 percent for the past 3 years. Specifically, BAP enjoyed a 38 percent growth in revenue in 2016. By launching an IPO, the parent company aims to unlock shareholders’ value in the automotive unit as well as provide a more transparent valuation benchmark for Mazda’s automotive business in the Philippines. BAP tapped Maybank ATR Kim Eng Capital Partners Inc. as the international and domestic lead manager and underwriter for the IPO and Maybank Investment Bank Berhad as principal adviser.